The Lake San Marcos Democratic Club was pleased to host Dr. Carl Luna, professor of political science at San Diego Mesa College, at the September monthly meeting. He spoke on an engaging and most relevant topic: “Democracy in America: Governing Amidst The Chaos”. Dr. Luna described a grim picture of the current state of affairs in our very divided democracy, yet a framework of hope for the future was also realistically discussed. Dr. Luna began by exclaiming, “Governing is becoming increasingly problematic. We are leaving a mess for our youth.” He first described “the ugly”. Democracy has been experiencing a decline around the world. Since the tragedy of 9/11 democracy has been under increasing challenges and is regressing. Global leadership is slipping away from the U.S. and is being handed to Germany, China and Russia. As seen in the ‘Economist’s Intelligence Report”, the “2016 Map Of Freedom” has the U.S. falling for the first time from a full Democracy to a flawed Democracy. The U.S. now ranks 21 out of 200, falling in between Japan and Italy. Since 2001, 72 countries have seen the decline of democracy. And this trend is not just a result of the current political environment but has been going on for years and is attributed to “an erosion of confidence in government and public institutions over many years.” As a result, the idea that “Amateurs are better than professionals” in politics has taken hold and given us the election of Trump in the U.S., Brexit in the UK, and Macron in France, who has not been well received. Which leads us to “the bad” – total gridlock in governing. Partisanship and deadlock is at an all time high in Congress and many citizens don’t trust Congress. A major contributing factor to this has been the practice of gerrymandering. Overall, Congress represents 350 million people but they were elected based on the voting of only a few thousand in their districts. A map of political affiliations clearly shows that Democrats need to move to small towns because the cities are overwhelmingly Democratic while rural America is very Republican. Political scientists say the country has not been this divided since the Civil War. The 60’s were worse, but we now have diversions such as video games and Netfilx that keep the youth occupied and distracted from the activism and protests seen in the 60’s. Obama said, “Reagan was the last President to leave really big footprints.” Trump exploited the trust gap, divisions and anger and appealed to people who were angry and frustrated. And they have plenty to be angry about. Mortality is up among white Americans aged 45-54 with no college degree due to suicide, liver disease, alcohol and drugs. “The forgotten men and women of our country will be forgotten no more” said Trump during the campaign. According to Luna, Hillary’s “Basket of Deplorables” statement was “the stupidest comment in the 2016 election” since many people feel left behind on both the right and left. What are the consequences? Confidence in institutions has eroded. 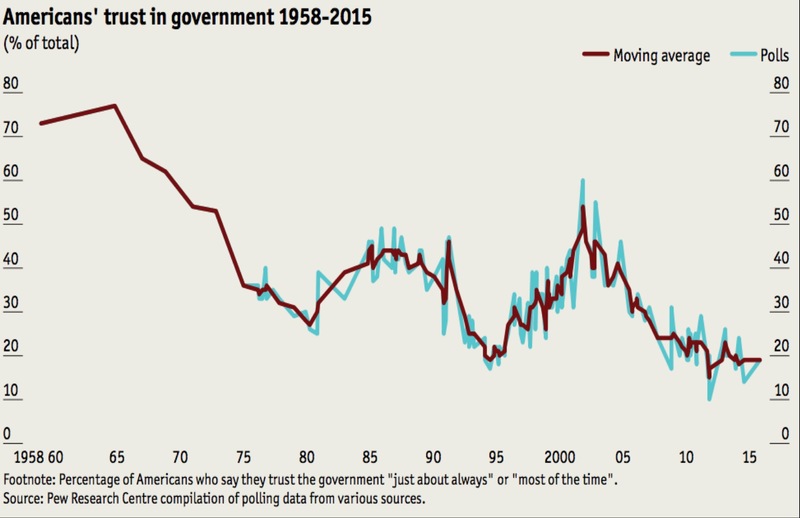 Trust in government in 1958 was measured at 70% while now it’s under 20%. The powerful benefit most if no one has your back as an average person. Congress is now less supported than communism in the U.S.! 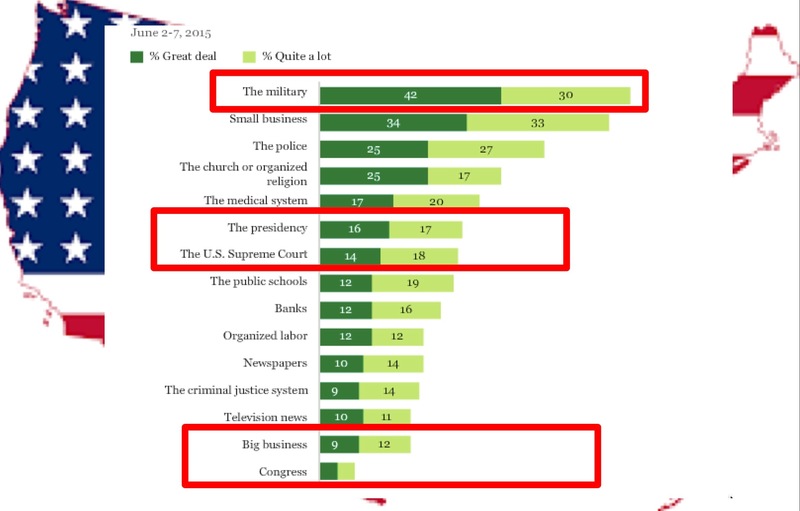 The military is trusted the most and this is a dangerous trend as this is how military coup d’etats happen. People are angry and desperate enough now to create dysfunction. Economic inequality is another huge issue for people and also contributes greatly to breeding distrust. Bernie Sanders preached it but Hillary, not so much. Even Trump said, “not everyone is getting pieces of the pie.” According to Luna, we must shift the models of production. Owners of companies such as Amazon and Google do great, but it requires government to step in over the free market. Like the “Gilded Age”, the wealthy control too much. They bet wildly and can crash the entire system. 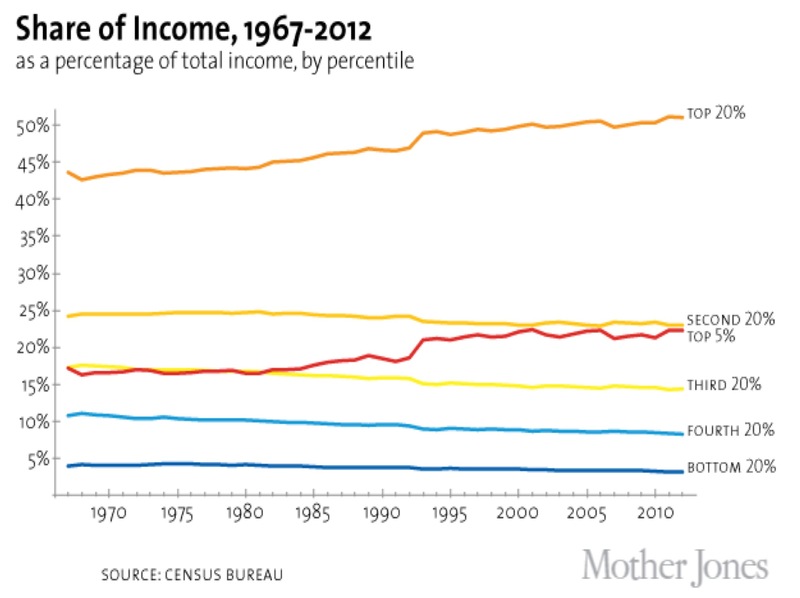 1980’s Neoliberalism was a monomaniacal “ism” to create wealth. Free trade is good, but we need retraining for those losing jobs for all workers, both Democratic and Republican. Deregulated markets got us economic collapse and the Occupy Wall St. Movement. (Dr. Luna recommends the book “Dream Hoarders: How the American Upper Middle Class Is Leaving Everyone Else in the Dust, Why That Is a Problem, and What to Do About It” by Richard V. Reeves). Our generation has rigged the system to keep it for ourselves, the top 20%, not just the top 1%. Now for the good! 2020 alone will not do it. The best we can hope for is a 50/50 split in 2018. Democrats have lost so many of the states with “Political Trifectas” where the Legislatures and Governor’s office are controlled by one political party. There are now 25 states with Republican trifectas, and only 6 with Democratic trifectas (https://ballotpedia.org/State_government_trifectas). It may take until 2030 to solve this dilemma. According to Luna, the current Democratic Party doesn’t have focus or leadership. There are too many candidates, over a dozen, being floated for 2020. It is a fractured party just as the Republican Party had too many candidates in 2016. We need systemic change! To succeed in 2020 Democrats will need much more effective messaging. “What was Hillary’s message?” Luna asked. “I’m With Her.” It wasn’t about her! On Hillary’s website, “learn about Hill and Tim” was featured rather than any policy they stood for! Karl Rove said you campaign on three things. Pick three. Better roads, better education, better jobs? Any three, just pick three. For Example: “Democrats are the party who brought you the end of the Great Depression, the Hoover Dam, and a man on the moon”. You can’t sell it unless people are buying it and people want a call to action. They want HOPE, and that’s why Obama was successful. Hillary won the majority of white college educated women by only 2%. Trump won Americans because of socio-economic issues more than racist or evangelical. “Change is in your hands, but people want to know that they are personally going to benefit economically” Luna explained. That is the challenge for the Democrats for 2020 and beyond.